So, now that we got the Canon C200 announcement out of the way, and before we see what Panasonic are cooking tomorrow at Cine Gear, it’s once gain time for the biggest video industry education event of the year! Some of you may have seen some of the teasers we shared on our Facebook and Twitter accounts, and now the 5DayDeal Complete Video Creators Bundle 2017 is finally LIVE. 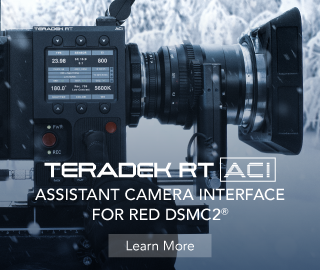 This is a killer opportunity to get $2,000+ worth of cinematography, video editing, and grading resources for the extremely affordable price of $97 and take your career to the next level. That’s a savings of over 95%! Some of you may recall we participated in the 2016 edition of the bundle, however just like every year, the resources included are brand new to the deal, so you are getting fresh, new resources that have never been made available as part of the bundle before. Five of the products included are also exclusive to this bundle. It is very important to note that the deal will end in precisely 5 days, so to make sure you don’t miss out hit this link here and get it for just $97! The Complete Video Creators Bundle has been curated exclusively to help video makers save time and money, hone their technical and creative skill, and advance their career. Whether you’re a photographer looking to do more video or a diehard cinematographer there’s something in this bundle for everyone—and the savings are remarkable. This bundle is a remarkable, once in a lifetime collection of expert training, tutorials, eBooks, software, and digital tools for all levels of video creation – there’s something awesome for everyone! The bundle is packed with online resources such as DSLR Cinematography for Beginners, a Lighting Workshop by Shane Hurlbut, ASC, Aerial Cinematography and Photography, and even learning materials for those interested in Learning How to Make Professional Videos with your Smartphone and many more! 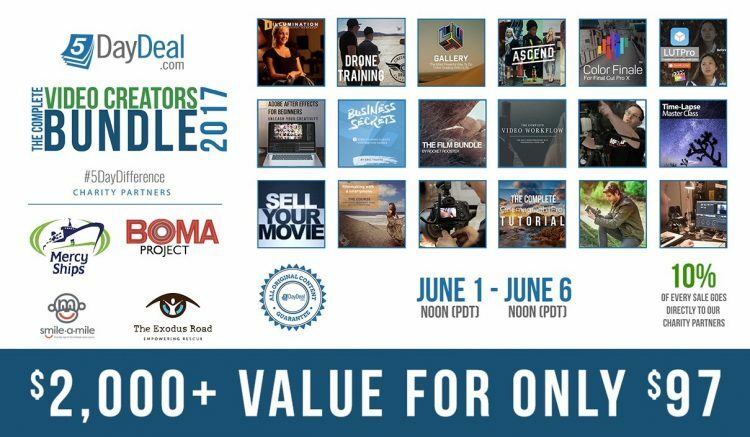 Normally the above resources would cost about $2,048 to buy separate, but right now you can get more than 95% discount by getting the Complete Video Creators Bundle 2017 via our link for just $97! HERE ARE SOME OF THE BENEFITS OF THIS AWESOME BUNDLE! Hone your lighting skills and learn the art of key light. Save time and get more creative in Final Cut Pro. Bring style to your edits with advanced filters. Shoot and edit corporate videos that clients will love. Get the Hollywood look with powerful colour correction tools. Learn how to efficiently create captivating after effects. Advance your video career by learning the art of distribution. Learn how to create a stronger narrative and tell a better story. Be a more creative and effective video maker for your clients. Learn how to fly a drone like a pro, and create stunning aerials. Discover how to be more creative and productive with your workflow. Create high-quality videos with your smartphone. Learn how to easily create captivating time-lapse videos. Save time using professional-grade LUT galleries. Gain on-camera skills that produce more engaging cinematic work. Unlock the technical mysteries of shooting video on your DSLR. CHARITY MATCH BONUS! WANT MORE? GET MORE. AND GIVE MORE! The best part of this whole event is that 10% of the bundle revenue ($9.70 per sale) goes directly to charity. How would you like to do good and get a reward of more than just a warm feeling inside? This year 5DayDeal have partnered up with a select group of video educators to bring you a charity match bonus. By selecting this bonus option at checkout you’ll double your contribution to charity and in return you’ll receive more than $500+ in additional shooting and editing resources! Help us break though our charity record of $60,000+ in 5 days and get some additional resources while you’re at it! Your extra support comes with a huge THANK YOU plus a bonus collection of exclusive products from some of our expert video creators. Mercy Ships brings hope and healing to the forgotten poor by mobilizing people and resources worldwide, without regard for race, gender, or religion. BOMA helps ultra poor women start small businesses in their rural communities, so they can pay for food, school fees and medical care for their families. The Exodus Road fuels interventions & rescues by providing funds, covert gear, technology, resources & staff to support local authorities in finding and freeing modern slaves. Smile-A-Mile’s provides hope, healing of the spirit and love for the whole family during the childhood cancer journey through year-round programming & more. Help us spread the word about this amazing video creators event for a chance to win prizes from our the sponsors of the bundle. Prizes will be awarded every day from June 1 – 6, 2017. GET THE 2017 COMPLETE VIDEO CREATORS BUNDLE for $97 via THIS LINK HERE.